Jackie K. Johnson has a long tradition of using a variety of evocative, totemic forms and sophisticated color to explore the twists and turns of her lived experience. Witnessing and experiencing the turmoil of personal loss, political upheaval, and the stresses of life on the body, Johnson channels her responses into her paintings. Her latest work reflects on the complexity of urban life in the 21st century. Densely packed images suggest bridges that morph into ladders and again, perhaps, into a striding figure. Natural shapes such as leaves and fish intersect with more industrial forms like smoke stacks or apartment houses. Several paintings have fragments tumbling away from the center, hinting at debris falling, but gently with some rhythm and intent. Overall, these paintings give a unique sense of moving through time and space, with intersections of motion and stillness, stability and instability, those things which in combination make up a life. 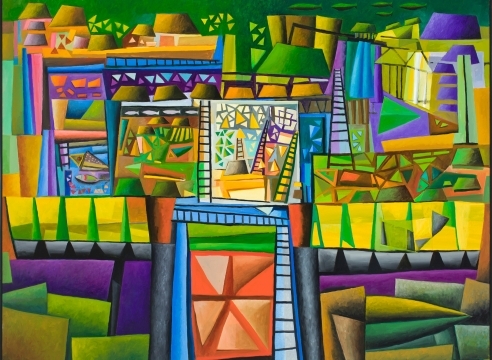 A native of Oregon and a graduate of the Pacific Northwest College of Art, Jackie Johnson made New York City her home from 1978 to 1993 where she worked and exhibited her paintings. She has been included in a number of gallery and museum invitationals such as the Blair Art Museum and the Johnstown Art Museum in Pennsylvania, the Academy of Art in Easton, Maryland, and 55 Mercer Street Gallery in New York. Her work is part of collections including the City of Portland, Meyer Memorial Trust, Oregon Health and Science University, Safeco Corporation and the Portland Art Museum.